What Does the Future Hold for Cardboard? We can all agree that the economy has not been exactly ideal over the past few years. Many companies have had to close their doors and stop operating due to lower demands and profit margins. Industries from retail to food to transportation have all taken a hit, but circumstances for the future are finally looking up. The transportation industry shows a promising comeback for shipping supplies. Since many consumers are beginning to purchase more and more items online, the US box demand is estimated to hit $36 billion by 2016 (a 2.6% annual increase). Whether shipments are coming from Tokyo or Miami, the products are placed in corrugated boxes, taped and secured, and slapped with labels to be sent on their way. In four years corrugated boxes and solid fiber boxes will post the fastest gain. This is because the corrugated box is the shipping container of choice for a broad array of durable and nondurable goods due to its strength and reliability. As far as markets are concerned, great opportunities lie in the chemical/pharmaceutical and food (carry-out) markets. Food is actually the fastest growing market and was responsible for 50% of the total corrugated box demand in 2011. Another promising factor is the rebound in construction expenditures. Increased appliance purchases for construction will help propel healthy gains for corrugated boxes. Boxes and folding cartons sporting high-quality graphics and printing will also generate great demand, as will retail- or shelf-ready containers, which are also expected to gain ground. Another material benefiting from this economic comeback is fanfold cardboard. Demand for folding paperboard boxes is expected to increase 1.7% yearly to $9.8 billion in 2016, trailing the corrugated box pace as a result of strong competition from flexible packaging and mini-flute materials. These folding boxes are less expensive than custom size boxes – all you need to do is cut to the desired length and wrap the material around large items. With time, the US economy will thrive and industry demand struggles will be a thing of the past. Now do your part and start that online ordering! If you wish to add that extra “umph” to your packaging, consider adding pouch packaging tapes and adhesive pads to your inventory. Both of these adhesives protect paperwork from moisture, tearing, and smudging on the exterior of packages. Whether you need to include work instructions, important documents, or promotional information, these little pouches are ideal to meet all these needs. Pouch packaging tape is made from clear polypropylene with a synthetic rubber adhesive. It can stretch around bulky documents with glue on all four edges, leaving the center adhesive-free to allow room for paperwork. These pouches are extremely efficient because they are linerless and allow for an effortless peel and stick application that will not pop or rub off. 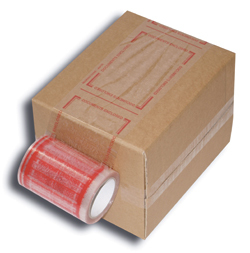 Usually, this packaging tape is equipped with a bright-colored (red or orange) border with messages like “Packaging list enclosed” or “Documents enclosed”. Packaging pads are very similar to pouches, just a little thicker. The pads are portable, convenient, and pre-cut with easy peel liner strips. 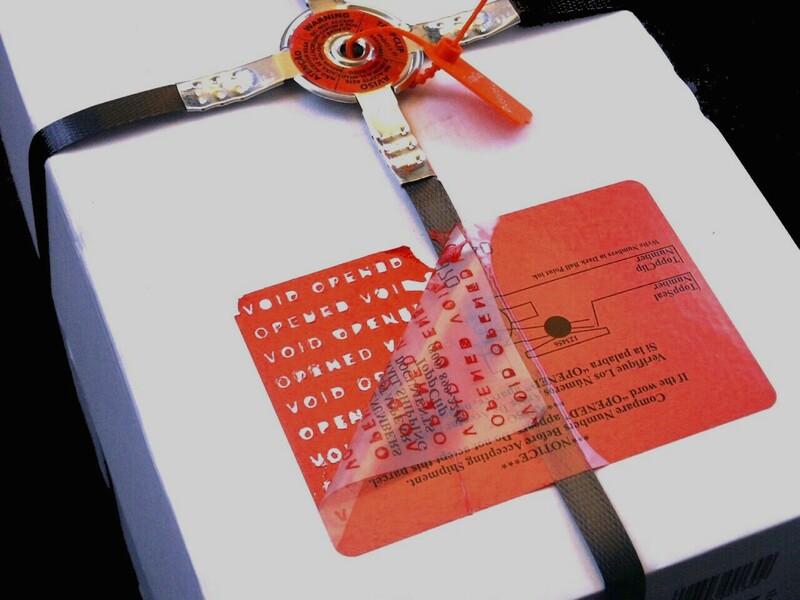 They also feature an adhesive-free center for paperwork and some form of “Documents enclosed” message border. Since they are pre-cut and ready for application, pads require no bulky dispensers or cutting tools. 1. T-tak tape is tissue paper soaked in an aggressive rubber based adhesive. It sticks well to paper, light plastics, and metal services. 2.Hi-Lo tapes are double coated with a permanent adhesion on the “hi” side and a removable adhesion on the “lo” side. 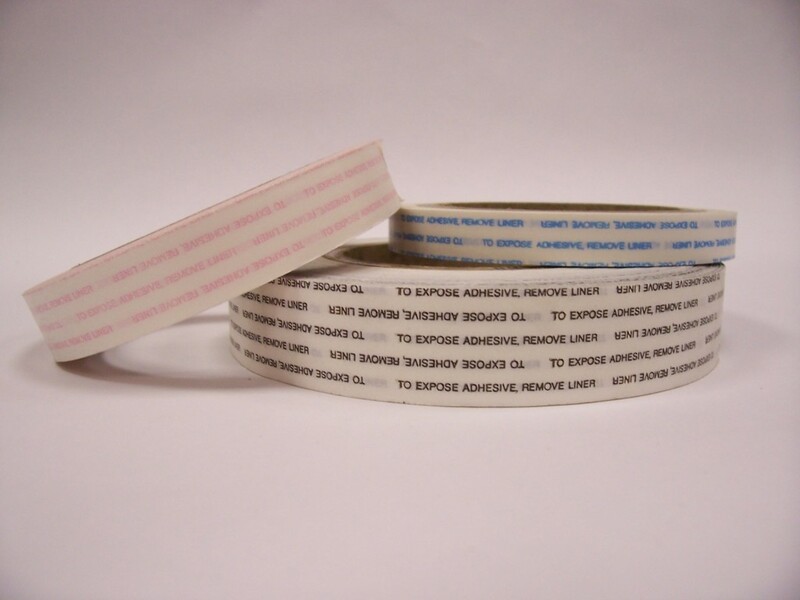 This tape is widely used to make reclosable bags, temporary signs or displays, and removable labels. 3. Unsupported adhesive tapes (or transfer tapes) are made from pure adhesives, almost like rubber cement on a roll. There is no internal structure to support the adhesive so they can be fussy to work with. 4. Last but not least there are bag-making tapes. These tapes have a plastic backing that can be side welded during the bag-making process and are either permanent or removable. Who ever said packaging tape was a simple industry? The endless variety of tape offers solutions for all your sticky problems while simultaneously adding value to your products and company. Like many inventions, cardboard shipping containers were born by sheer accident. In the 1870s an American printer named Robert Gair cut a paper seed bag by mistake with a metal ruler. He quickly realized he could create a sturdier container with paperboard. Fast forward 140 years later – cardboard boxes are produced from a variety of materials in all different shapes, sizes, and colors. There are three main materials cardboard shipping containers are made with today: corrugated fiberboard, paperboard, and recycled items. 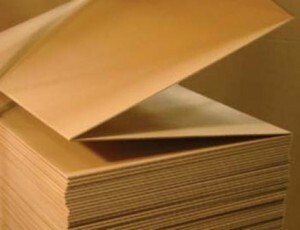 Corrugated fiberboard consists of a folded flute corrugated sheet encased in one or two flat linerboards. (The linerboards are generally from containerboards, which are paper-thick.) Fiberboard was first used in the mid 19th century to bundle pottery and glass containers and is now widely used to produce containers and corrugated boxes for shipping and storage. Another option when manufacturing cardboard shipping containers is paperboard. Paperboard is thicker and stronger than paper and is either singled stuffed or multi-ply. It is extremely lightweight and can be transformed into containerboard, folding boxboard, bleached/unbleached board, or chipboard. Finally, there is the increasingly popular recycled cardboard shipping container. Solid wood pulp manufacturers usually make recycled products by turning old boxes and sheets into useable materials. These alone result in a 24% power savings and thus less space occupied at your local landfill. These three materials are usually transformed into your standard square shipping or storage box; however, multi-depth boxes and easy-fold mailers are two other options. Multi-depth cardboard shipping containers have sides creased at intervals, so all you need to do is cut to the desired height and you have a custom-sized carton with a perfect fit. 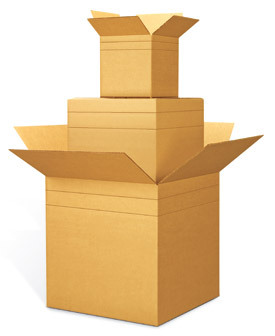 These boxes are strong, durable, and are usually produced from corrugated fiberboard. By using these adjustable containers, you can save money and warehouse space. Easy-fold cardboard mailers can either be corrugated or not, and when first impressions matter, they are an excellent product to consider. Mailers offer protection for mailing, storing, shipping, and displaying products. They are crush resistant and require no glue, tape, or staples. Instead, they are equipped with an adhesive strip for sealing and an easy-open tear tab for quick access. These cardboard shipping containers can be custom printed to provide that extra detail that will distinguish your company from the rest. Paper, cloth, polyester, and metal – tapes are made of many different materials to meet the demands in a variety of industries. Particularly used in the industrial, appliance, marine, and aerospace industries, foil adhesive tapes offer economical solutions for a number of tasks. Foil tapes are mainly desired because they offer extreme malleability and conform well to irregular and curved surfaces. The three most common foil tapes are aluminum, lead, and copper. Aluminum adhesive tape can either be manufactured with rubber or acrylic glues, with or without a liner. A rubber adhesive is efficient for moderate demand applications. The tape is soft aluminum foil coated with an aggressive hot melt synthetic rubber paste and has a removable release liner. More aggressive versions are used for fiberglass duct board systems on seams and joints to maintain the integrity of the vapor barrier. Acrylic adhesive tapes are also used for vapor barrier protection, as well as for waterproof sealing, heat reflection & dissipation, and masking in paint stripping & electroplating. If the tape is processed without a liner it is self-wound, making it an excellent harness wrap tape. Utilized for non-critical applications (sealing out dust and moisture), the non-lined foil adhesive tape saves time and labor in stripping of release liners and produces much less waste. Since it is widely used in refrigerated appliances and microwave ovens, the high reflectivity assures effective heat, light interference, and electrical insulation shielding. Overall, aluminum foil tape is an aggressive, long-lasting, pressure-sensitive adhesive that demonstrates superior bonding when exposed to both sub-zero and elevated temperatures. 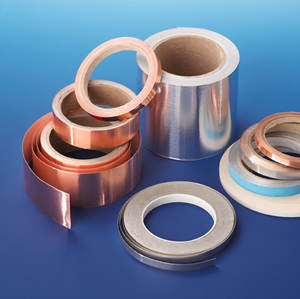 Copper foil adhesive tape is the second type of foil tape. It has excellent solderability and creates a superior bond. Preferred in the telecommunications industry, copper foil tape can be conductive and has a very low rate of electrical resistance. It is also used for electro-static shielding, cable wrapping, stained glass work, and other arts and crafts. Many users also choose this tape because it is annealed and non-tarnishing. Last, we have lead foil adhesive tape. This is made of 100% pure lead foil and is highly pliable for the most intricate patterns. It can be applied to metal, glass, films, foils, or paper as a mask to eliminate the chemical impacts of electroplating or chemical milling. Like the other two types, lead foil tape can be applied as a moisture barrier or for thermo pane window sealing and has a weather, solvent, and heat resistant coating. All in all, the shiny, UV resistant foil backing on these adhesive tapes offers unlimited benefits. An enhanced appearance, excellent reflective and flame retardant properties, and resistance to cracking and lifting around irregular surfaces are just a few advantages that come to mind. Purchase your first roll and find out for yourself! As one of the distribution leaders for shipping supplies in Miami, TOTALPACK has explored various products to help companies reduce operational costs and increase their overall efficiency. One tool that has caught the eye of many is the amazing Toppclip. Toppclips are designed to secure a pallet by indicating evidence of tampering with banding or strapping. Thieves can easily access pallets with conventional banding and remove or replace it with little skill or effort. Once this banding is removed, the contents can be removed or contraband can be added. By adding Toppclip to your inventory of shipping supplies, these pilferage problems will diminish. Once applied on crates, totes, or slip trays, this handy tool makes tampering or replacement of the banding extremely difficult without leaving signs of meddling. The Toppclip is comprised of a metal clip for banding, a plastic adjustable seal, and a tamper evident warning label. The combination of these shipping supplies provides an armored seal to keep thieves out. The great thing about this tool is each component has a unique serial number. If the shipper records the number before sending the package and the receiver verifies it upon arrival, both individuals are assured that no one has tampered with the package, decreasing stress and concern on both ends. The Toppclip meets the chain of custody specifications of the TSA for sealing CCSF (Certified Cargo Screening Facilities) containers. 8 ) Punch hole in strapping – position punch over the hole in the metal Toppclip. Punch 1/8” diameter hole in the strapping through the Toppclip hole. Stretch wrap is most commonly used to wrap pallets and secure items together as one bulk shipment. However, many different industries use various types of stretch wrap to meet their needs. One popular kind of film is stretch netting, which is lightweight stretch wrap manufactured with little holes for ventilation. This is widely used to protect flowers, produce, dairy, meat, lumber, and many other products across an array of industries. Stretch netting is made from high-density polyethylene (HDPE) and has a standard strength of 140lbs. Companies use this type of stretch wrap primarily if they face problems with condensation causing the product(s) to spoil. For instance, some products are boxed and palletized while they are still warm, so this gives moisture time to collect on the inside of the cling film and eventually deteriorates the boxes and sometimes damages the goods themselves. Condensation also causes other problems such as rust on tins and caps, discoloration of packaging and labels, and impaired performance of glues. Due to its well-vented makeup, this stretch wrap also shortens freezing and defreezing time because the moisture can escape faster and products are subject to an even cooling process. In addition to eliminating condensation and allowing frozen products to evenly thaw, stretch netting maintains the freshness of perishable products by providing optimal air circulation (mainly for plants and produce). Very similar to netting is a specific type of stretch wrap called Air Flow. Air flow is a die cut pallet wrap that services the agricultural, industrial, and manufacturing industries. Just like the stretch netting, Air Flow releases condensation from the pallet, reduces spoilage, and evenly cools products wrapped in the film. This wrapping is recyclable and requires less landfill space, reducing your company’s waste output. Air Flow is practical for any business, saving labor time and effort by its quick and easy installation. 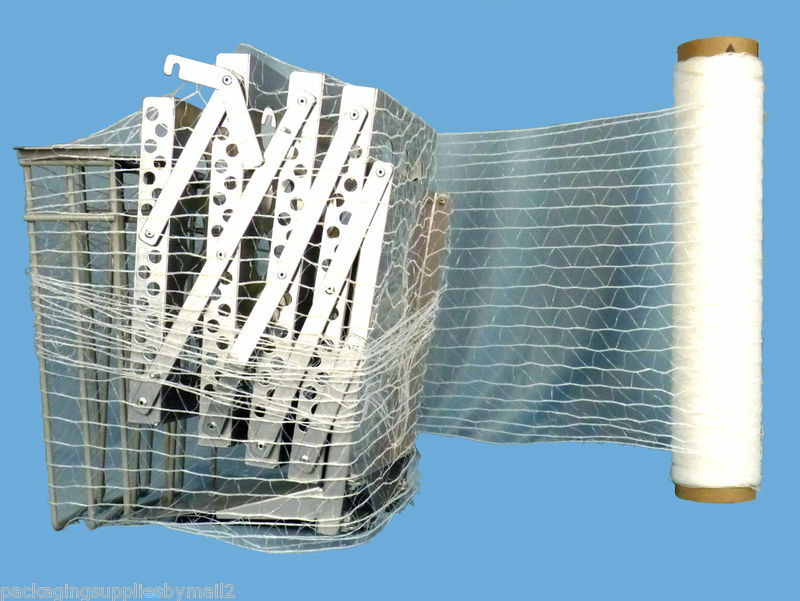 The film works on conventional stretch wrap machines, never has to be tied off, and only requires one person to apply. The next time you need to ship an item that requires air ventilation to either preserve its freshness or prevent it from spoiling, consider stretch netting as an alternative. 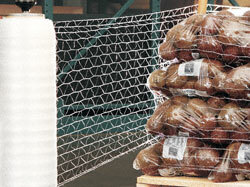 This stretch wrap netting is extremely efficient, cost effective, and ensures that no internal heat will materialize. This product is available upon request at a competitive price at TOTALPACK. Just call 305-597-9955 today! These two terms are often used interchangeably for packaging purposes. Yes, both are used to wrap and secure items that are being packed, stored, or transported. However, stretch film and shrink wrap are two entirely different materials with distinctive properties and uses. First, we have stretch film. Stretch film is typically bigger and longer than shrink wrap and has the ability to expand. It is usually a clear plastic material (similar to saran wrap) that is made out of polyethylene plastics. The film is designed to bundle multiple products together or to provide stability to a package of items (usually on a pallet). Stretch film tends to cling together as it is wrapped over itself, creating an easy seal, and tension is required for strength and security. Stretch film is applied two different ways: manually or with a machine. Manual application of the film simply involves an individual holding the spool of film and walking around the package to secure it. Application with a machine can be done with either a semi-automatic or automatic mechanism. Typically, a company would want to invest in one of these machines if they were wrapping more than 15 loads a day. They not only increase efficiency but also reduce the total amount of waste produced. In addition to the clear stretch film, there are many other varieties available. Here are a few: UV stretch wrap, vented pallet wrap, anti-static film, colored stretch film, and pre-stretched stretch film. In contrast, shrink wrap does not have the same stretchy or clingy saran wrap properties. Instead, it is made from polymer plastic films and is designed to package a single product or hold items together. Shrink wrap is placed loosely around the item once and cut around the product using a heat sealer or shrink wrap bar. This film provides a tamper-proof barrier and protection from moisture and dust during transportation or storage. If shrink wrapping has been properly applied, you should have no issues with chafing or damage and the package should represent a professional wrapping job. Some advantages of this film include fewer odors when sealed, a stronger overall seal, and more flexible storage. Also, shrink wrap has the option of being ventilated, therefore reducing any damage that can occur from moisture. Multiple industries use shrink wrap for a number of different tasks. For instance, it can be used to wrap buildings or roof parts especially after some disasters (such as hurricanes and tornadoes). It can also facilitate safer removal of asbestos and other hazardous materials. This film is especially popular when it comes to CD/DVD manufacturers and food items such as cheese and meats. Shrink wrap and stretch film are certainly intended for different purposes. Nonetheless, it is good to know that both of them are recyclable and have numerous uses. Now that you are familiar with the distinctions between these two, it is easier for you to determine what type to order from your service provider.